I take it you received our update newsletter, and you clicked on through to check out my blog. This is a work in progress, and there are big design changes in store very soon. Please excuse pages with missing information and photos…all will be completed soon in colorful, bright shininess. So glad you’re here though. If you want to find out a bit more about why and where I’m headed, please read my New Beginnings post which sort of sums it all up. 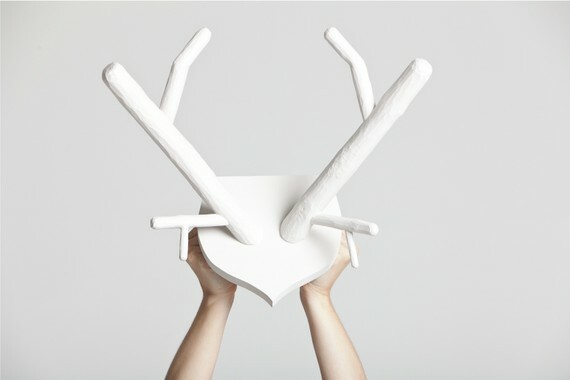 A few years ago, I was interviewed by the LA Times about the growing Deer Head trend in design…a term I coined “Faux Trophy” while I was writing for the just launched social shopping site ThisNext as a blogger and product guide (under the pseudonym “Aunt Beep”). While my house is still devoid of any Faux Trophy, I do have a space above our new exposed stairwell which has been patiently waiting for the perfect ode to the dead deer. I have been considering going waaaay over the top with this moose head, but to be honest the Dear Deer Antlers are a bit more my speed: clean, subversive, handmade, and will actually fit in the space. Yesterday we made the announcement that the ecommerce site I co-founded and have been running for 4 years is closing its doors. We didn’t come to this decision lightly to say the least, but my partners and I are moving onto other projects for now, and perhaps at some point I’ll pen the nitty gritty of how and why we decided to close, and the trials of running an independent ecommerce business in this crazy world. Delight.com was my first “baby”, and it has been an amazingly insane four years bringing the site to where it is now. We’ve been fortunate to have amazing press in just about all the major women’s magazines (except for YOU, O Magazine!) and lots of TV features as well. I have thoroughly enjoyed shopping for all the products, managing the creative aspects of the site and working with so many fine editors and producers to have our products featured. I can’t say I’ll miss the 24/7 work days, but I will miss Delight terribly. What I wasn’t fully expecting was the lovely notes and well-wishes from our customers and fans. While we have had to endure our share of serious kray-kray over the years, for the most part our customers are just the best; and yesterday proved it. For my own memories I thought I’d pull some of the sweet tweets, facebook posts and emails we received so I can always remember how incredibly impactful taking 1 minute (or in the case of twitter, 2 seconds) to write kind words to a virtual stranger can be. These notes made all the hard work worth it. But where will I find all the lovely things that make friends and family ooh and aah? Good luck and thx to all of you! Wow! Delight is closing? You guys have opened me up to a whole new world of shopping! As I look around my home, I see so many things that came from Delight. Thank you, thank you for bringing me such great products and teaching me to love the earth. I’m never without my Rue Me bags! Take care! Sad news from some fun ladies today. There is no other site out there that could fill your shoes! A huge gaping hole in cyberspace will remain forever. Thank you for the years of creative items and fun packaging. You will be missed! always looked forward to checking out Delight.com for new, interesting, innovative & awesome products. You will certainly be missed, keep us up-to-date on your new endeavors, I’m sure your adventure will be fabulous & I don’t want to miss the ride! So sorry to see your sunny shop go! Best of luck in your future endeavors. Peas & carrots and all things delightful! I am HEARTBROKEN to hear about the site! I understand though, having worked for small businesses in the past. Good luck to you! I also do television appearances and speaking engagements on the above topics. People say I’m funny. 2) My husband and I have been renovating our 1963 Ranch for 4 years now, and I need a place to keep track of all our adventures. 3) I have two gorgeous & insane dogs – Fran and Lucy – and I think I should show them off to the world. 4) I’ve been running and ecommerce company for nearly 7 years now, founding three sites that specialize in gorgeous gifts. I love discovering fantastic new products and sharing them with others. 5) I’m passionate about healthy living, cooking great food and all that surrounds those ideals. I recently had my first child, so these topics are even more dear and important to me, and I’ll be sharing those thoughts with you. So onwards and upwards we go! !